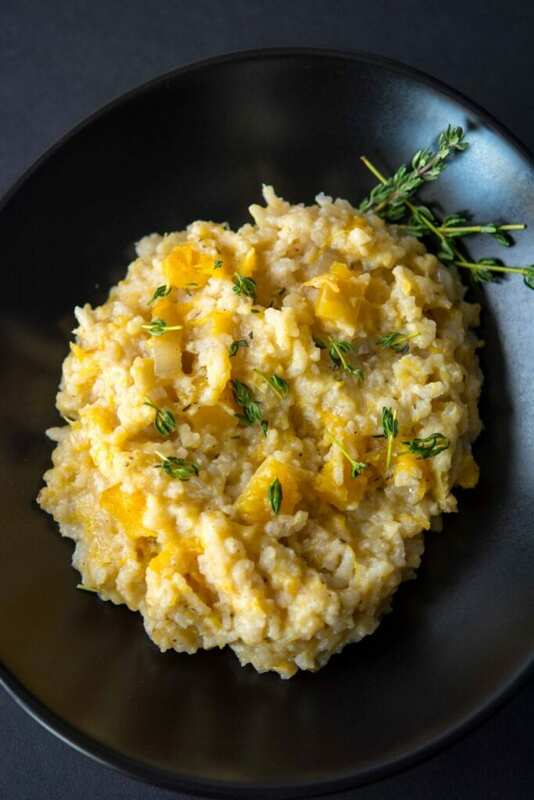 I went to a fancy schmancy restaurant once a few years ago and felt so sophisticated ordering the butternut squash risotto they had on special. It was rich and creamy and yummy and I remember thinking I would love to try and make it at home. I did eventually get the courage to make a risotto but I started out with just a simple Parmesan risotto. It wasn’t as scary as people had made it out to be but still it was a lot of work to stand at the stove that long just stirring. It’s one of those dishes you can do so much with by changing up what you add to it and it can make a satisfying main dish or side that can go with so many dishes. 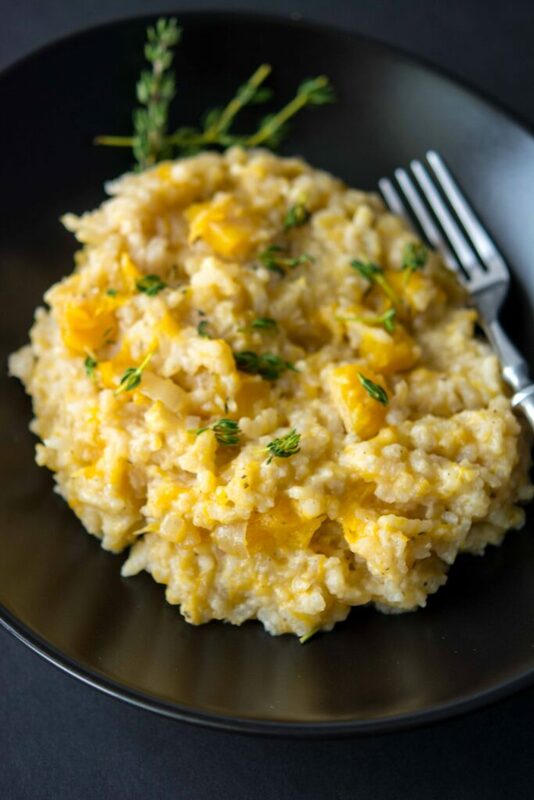 I knew I needed to find an easier way to add it to our line-up and find a way to make crock pot butternut squash risotto. 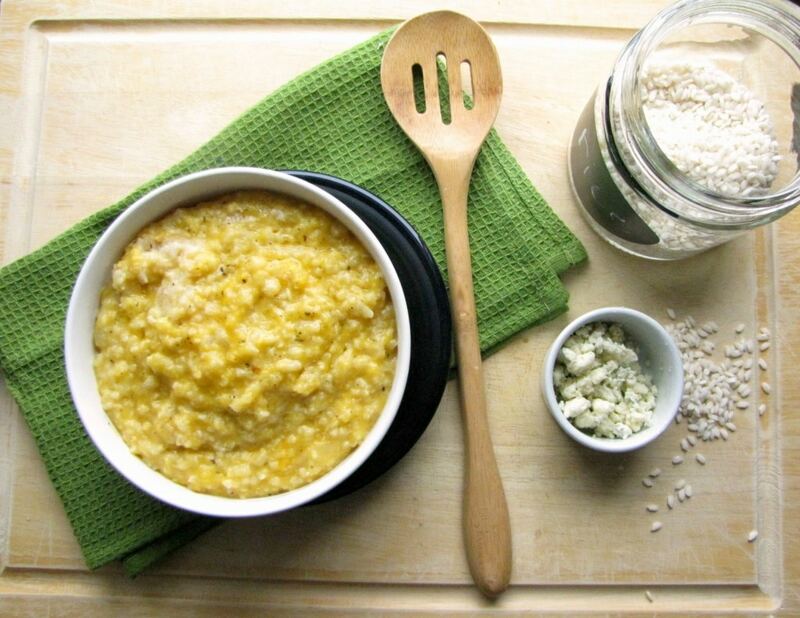 I remember so well when I was doing my morning blog search for recipes and happened to come across a recipe for risotto in the crockpot! I’m pretty sure I ran right out to the store and picked up the ingredients so we could have it for dinner. Again, it was just a basic risotto, but it was so exciting to throw all the ingredients in the crockpot and walk away. 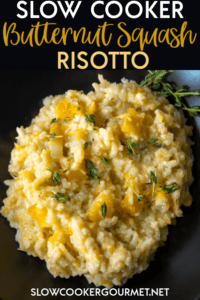 It was delicious and I decided at that point I could find a way create a crock pot butternut squash risotto recipe. Do keep in mind this will not not be quite the same texture as a risotto cooked on the stove. It will be a little softer but will still have the same great flavor without all the work! Question: can you use fresh instead of frozen butternut squash & if so would it change the cook time? Thanks! Yes, you can but I can’t speak to the cook time as I haven’t tested this out yet. What size slow cooker do you recommend? A 5-6 quart is best for this recipe. I don’t think it will freeze well. I would halve the recipe instead. Thanks for your feedback! I was reading through comments specifically to see if I should saute the onions ahead of time. 2 hours in the crock pot does not seem long enough to make the onions as soft as I would like them. Going to saute them first! I love the flavor of onion, but I think the crunch would ruin a creamy rissoto! Made this at my desk today for the holiday potluck (premeasured/chopped this morning, threw it all in the crockpot at my desk, set to cook for 2.5 hrs on high, & done). It was perfect! I thought about doubling the recipe, but given the number of other dishes there’d be, I didn’t – I made the right choice as there was hardly any leftover.